 Mew Gallery: About the Artist - Thora Clyne M.A. which I was a member, and in many shows in Great Britain and overseas. "Shrimp Girl and Stones" watercolour purchased from auction by Dr John Munro for Western General Hospital, Edinburgh, 2003. Two murals created with 1st year group of Edinburgh College of Art students in X-ray Dept., Sick Childrens Hospital, Edinburgh,1990. Two week long Workshops held with John McNairn for SCADART, Stirling University and Creiff Hydro, in 1982 & 1983. 'Art in Bloom', Kirkcaldy Art Gallery, Scotland, 1993. 'Sheepshapes, Summer Scenes and Still Life', Lybster Gallery, Caithness, Scotland, 1993. 'Five at the Forth', Forth Gallery, Edinburgh, 1996. Chessel Gallery, Edinburgh Festival, 1996. Scotland's Gardens Scheme Summer Exhibition, Royal Botanic Garden, Edinburgh, 1996 & 1999. Braveart, The Smith Gallery, Stirling, Scotland, 1996. Morrison Portrait Award Exhibition, Royal Scottish Academy, Edinburgh, 1991, 1995, 1997. Society of Caithness Artists Annual Exhibition, Thurso, Scotland, 1997, 98, 99, 2000, 1, 2, 3 and 2005. Highland open & Touring Exhibition, Inverness Art Gallery, 1998, 2001-2. Summer Exhibition, University of Northumbria, Newcastle, 1999. NYAD2000 Group show, DFN Gallery, New York, USA. Highland Arts, Glasgow Art Fair, 2002. Hanover Fine Arts, Mixed Exhibition 11, Edinburgh, summer 2002. Christmas Exhibition, Torrance Gallery, Edinburgh, 2002. Edinburgh Printmaker's Workshop Gallery, Glasgow Art Fair '03, Glasgow. April 2003. Scotland's Gardens Scheme, Third Summer Exhibition, Glasgow. May 2003. The MacRoberts Open 2003 @ Art Exposure Gallery, Glasgow. May 2003. Dunkeld Cathedral Art Exhibition, The Duchess Anne Hall, Dunkeld. June 2003. Royal Glasgow Institute of The Fine Arts Postcard Exhibition, RGI Kelly Gallery, Glasgow. August 2003. Paintings by Thora Clyne and Anthea Lewis at The African Furniture Gallery, Glasgow. November 2003. Hanover Fine Arts, Spring Mixed Exhibition (Part 1), Edinburgh. April - May 2004. Wick Gala 50th Year Art Exhibition, Caithness, 2004. Hospitalfield, Arbroath, Alumni Trust Exhibition, Roger Billcliffe Gallery, Glasgow, 2004. Small Paintings for Christmas Exhibition, Hanover Fine Arts, Edinburgh, 2004. Highland Open, Inverness and Wick, 2004; Thurso, 2004-5. "Highland Open", Iona Gallery, Highland Folk Museum, Kingussie. Final venue of 2004-5 exhibition. April 2005. "Cats' Protection", National Cat Centre Exhibition by the Society of Feline Artists, Sussex, April 2005. 20th Anniversary Show, Hanover Fine Arts, Edinburgh, May 2005. The MacRoberts Open 2005, Art Exposure Gallery, Glasgow, May 2005. Salon des Arts: "Challenge the Nail Exhibition 2005", London, June to July 2005. Wick Gala Week Art Exhibition, Caithness, July 2005. Creative Perthshire Exhibition, November 2005 and May 2006. Christmas Fair, Scotlandwell, December 2005. RGI Christmas Postcard Exhibition, Kelly Gallery, Glasgow, December 2005. Highland Open, Inverness, March - April 2006 and Thurso, August 2006. 21st Anniversary Exhibition, Hanover Fine Arts, Edinburgh, May 2006. Portmoak Festival Exhibition, Portmoak, June 2006. Summer Mixed Exhibition, Hanover Fine Arts, Edinburgh, July 2006. Thora Clyne M.A. Hons Fine Art (Edin) - Landscapes, Flowers, Figures and Cats in oil, watercolour and print. William Daniel Clyne D.A. (Edin) (1922-81) - Banffshire Landscapes and Figures in watercolour and ink. Les Drummond D.A. (Edin) (1920-97) - Imaginative Works in acrylic and watercolour. PVAF ONSCREEN, Perth Theatre, May to July 2009, slide images of works on show. Own Studio Open Day, Perthshire Open Studios, September 2009. New City House, Fife Council, Dunfermline, October to November 2010. Edinburgh Art Fair, Hanover Fine Arts, Edinburgh Corn Exchange, November 2010. Laurel Gallery, Stockbridge, Edinburgh, mixed exhibition, February 2011. Perthshire Open Studios: Thora Clyne at Mew Gallery, September 2011, 2012, 2013, 2015. "Two Artists", Bon Papillon Gallery/Cafe, Howe Street, Edinburgh, Feb to March 2012. "Encounters with Place", PVAF Exhibition, Perth Theatre, October 2011 to March 2012. 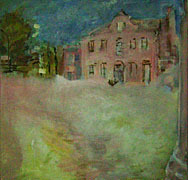 Watercolour from Memories, demonstration and talk given to Perth Art Society, Perth Museum and Art Gallery, March 2012. "Light, Colour, Land" group show, Bon Papillon Gallery/Cafe, Howe Street, Edinburgh, April 2013. Loomshop Gallery, Lower Largo, Fife, Scotland, 1971. Open Eye Gallery, Edinburgh, 1975 & 1977. Lyth Arts Centre, Caithness, Scotland, 1977. Royal Bank of Scotland, Ladies Branch, Edinburgh, 1974, 1975 & 1979. 'A Northern Summer', Henderson Gallery, Edinburgh, 1980. 'Cats Predominate', Torrance Gallery, Edinburgh, 1982. 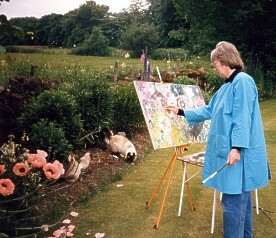 'A Wild Garden', Primrose Gallery, Haddington, Scotland, 1983. 'Memories', Torrance Gallery, Edinburgh, 1985. 'Wild Places and the Company of Cats', N.B. Gallery, Loch Lomond, Scotland, 1986. 'Solitude', Torrance Gallery, Edinburgh, 1991. COAST Festival, Banff, May 2009:- curated William Daniel Clyne Retrospective Exhibition. The Dictionary of Artists in Britain since 1945 by David Buckman. The Dictionary of Scottish Painters by Paul Harris and Julian Halsby. Dictionary of Scottish Artists by Peter J. McEwan. "Welsh Blankets", lithograph, published in "Stone Lithography" by Paul Croft, 2001. "Honey in the Wild" lithograph, published in "Plate Lithography" by Paul Croft, 2003, A & C Black. was purchased for Tullibole Castle, Crook of Devon, Kinross-shire.